I have had my eye on the Purple Sandpiper for a few years now. It occurs regularly in winter and early spring off the south (and less frequently off the west) shore of Brooklyn, and also has appeared at nearby Liberty State Park (in New Jersey, but right off upper New York Harbor) and at Pelham Bay Park in the Bronx. There is a historical record of it on Governors Island from 1985. The species almost certainly passes through Manhattan waters every year. Yet there have been no chaseable reports of Purple Sandpiper in Manhattan during the years I have been actively birding (since 2011) until May of this year. I expected to find it first on the rocky northeast shore of Randall’s Island, one of the best few spots in the county for finding shorebirds and other unusual waterfowl. I visited Randall’s Island dozens of times in the cold months, always scanning the rocks for birds. But I never saw a Purple Sandpiper there. Then in the early evening of May 3 this year, a reliable birder observed three Purple Sandpipers on the rocks south of Roosevelt Island. It appears that he was initially unclear as to the ID of the birds, which might explain why he did not report them until well after sundown. I got in touch with Andrew Farnsworth, who can view Roosevelt Island clearly from his apartment using a scope. He looked for the sandpipers to reappear the next day, but he did not see them. I figured they had flown along on their way. Then this last Sunday, May 17, I was online when an eBird Year Needs Alert arrived at 7:18 p.m. Another reliable birder had seen a single Purple Sandpiper on the rocks at the south end of Roosevelt Island shortly after 6 p.m. The bird soon went out of view on the east side of the rocks, which is perhaps why the birder did not issue a real-time text alert. With Four Freedoms Park, from which he did the viewing, closing at 7 p.m., it would be impossible to look for the bird from where he did. My only option would be viewing it from the Manhattan shore of the East River at 51st Street, part of Detmold Park. Could I reach it in time? I would have to get dressed, take the subway to 59th or 53rd, and then run to the river. This would take 30 minutes or so — I have done it before — and that would leave me barely 15 minutes before sundown. The Manhattan skyline probably already would be shading Roosevelt Island. Moreover, had no idea if the bird had come back into view. It seemed the chase was likely to be a huge waste of time. I texted Farnsworth to see what he was going to do. Unbeknownst to me, Farnsworth had immediately grabbed his binoculars and set out for Detmold (a few minutes away) as soon as the alert arrived. He ended up not only seeing the Purple Sandpiper, but also a flock of twelve Dunlin that were flying between the rocks and nearby Belmont Island. By the time I heard back from him it was just after sundown and much too late for me to go. I would have to try for these birds the next day, with no guarantee that they would remain overnight. Monday began foggy, and Farnsworth was unable to see the rocks and check for the bird. By the time the fog cleared the tide was near its high and probably not suitable for the sandpiper to forage on those rocks. I would have to go later in the afternoon, a bit after low tide, for the best chance of seeing the bird. My plan to take the F subway line to Roosevelt Island was, shall we say, derailed by a subway power outage in Queens that put the F line out of service. I would have to go on foot from 63rd and Lexington to 51st and the East River, and I would miss out on having a close view of the rocks. In fact, I would be over 360 meters from those rocks. I arrived at Detmold Park at 4:35 and saw no Purple Sandpiper. At 5:03 I saw a small sandpiper flying between Roosevelt Island and Belmont Island and then back. I thought it might have been the Purple, but because of the distance and the poor light from overcast skies I could not be sure. It disappeared again on the west side of Roosevelt. At 5:35 I was close to leaving when I saw a small peep walking on the rocks and briefly popping up in flight. It stayed in view for less than 30 seconds. But I saw it clearly. It was dark on top with a lighter underside and a plump, rounded shape — definitely not a Spotted Sandpiper. Nor was it tail-bobbing. It was clearly foraging right off the rocks themselves, a behavior you would generally not see among the more common sandpipers that occur in the area, which prefer to probe mud. It had to be the Purple Sandpiper, my 249th lifetime Manhattan bird. After I finished trading the market this morning, I had a brilliant idea: visit the Hudson by Inwood to watch raptor and waterfowl migration. Winds would be favorable (northwest and strong) for the first time since the cold air arrived yesterday. I emailed Andrew Farnsworth to let him know my plan. It turns out Farnsworth was, as usual, already a step ahead. He had been birding the Dyckman ball fields area of Inwood Hill Park since 10 a.m. and his lengthy eBird list arrived in my inbox before I was even ready to leave. He warned me that the birds were flying high and that I would want to bring a scope, but 10 x 42 binoculars were all I had, and besides I was already walking across the park on my way to the C train at 86th Street. He was on his way back home, but he planned to be back in the afternoon again. I went first to Fort Tryon Park, thinking that the extra 200+ feet of elevation would help me get better views. I arrived at 12:40 p.m. Within ten minutes I saw an adult Bald Eagle fly low and directly overhead — I was off to a great start. But this was nearly all I saw, and after forty minutes I decided to try the Dyckman fields. I immediately started seeing more birds, mostly geese and Red-tailed Hawks, that were swerving east over the hill and thus not passing over Fort Tryon. Somewhat later, at 2:35 p.m., a text alert arrived: Sandra Paci (who took part in the birdathon in honor of Starr Saphir) had found a male Northern Pintail on the Lake in Central Park, just west of the Point. Right away I texted Farnsworth that I had to leave Inwood to chase the pintail. Northern Pintail observations in Central Park are extremely rare. 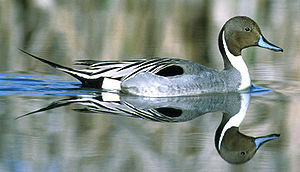 The last verified one was from February and March of 2007, when a male pintail overwintered on the 59th Street Pond. They can be had in flight over the East River, but that takes a lot of watching and some luck. I went directly toward the the Dyckman 203rd Street station and quickly caught the express train going downtown. By 3:20 I was in Central Park on the south side of the lake, west of Bethesda Fountain and north of Cedar Hill. I scanned the shoreline of the Point and quickly found the duck sleeping under a tree branch near some Mallards. It was well concealed from most viewing angles and not showing any movement. If this is how it was when Sandra found it, it was certainly was not an easy find. By 3:30 I was on my way back to join Farnsworth for more migration-watching in Inwood. We got in a half-hour of viewing before he had to leave, with the highlight being another low-flying adult Bald Eagle. The Northern Pintail became my 233rd lifetime Manhattan species and 191st of 2013.